Ed Atkins. Happy Birthday !!! 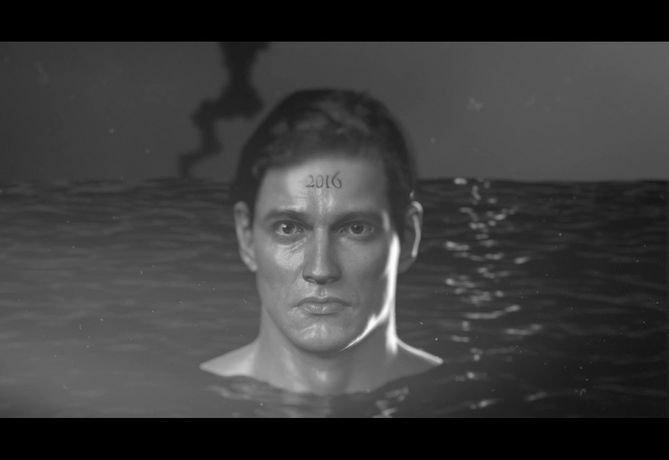 Save Event: Ed Atkins. Happy Birthday !!! Share Ed Atkins. Happy Birthday !!! The Musée d’Art moderne is pleased to present Happy Birthday !! !, an installation by Ed Atkins, in its permanent collections. Happy Birthday!!! is a computer-generated animation in black and white. More disturbing than its title suggests, it accords a central role to death. One also detects furtive allusions to Bruce Nauman's Self-Portrait as a Fountain(1996), Alice in Wonderland and a drawing by writer Pierre Klossowski for his book L'Adolescent immortel (1994). The intermittently appearing numbers are like mysterious codes: impossible to say if they refer to dates, quantities or durations. Indirectly they suggest the binary code figures 1 and 0 which, like words in literature, enable the creation of entirely imaginary worlds. This work confronts the effects of the omnipresence of the digital on our lives and memories: for example, in the long run those automatic birthday reminders entrusted to our mobile phones can only lead to disruptions. Ed Atkin’s work was featured in “Co-workers”, an exhibition of post-Internet art shown at the museum in 2015.